Setting up a project with Unity is different than its C++ brother. Our implementation is based on native plugins, and hence you need to prepare the sample accordingly. Here are the basic steps to perform in order to integrate the Clan in Unity. Just double click the file and it will install automatically. All the native plugins (Java and C++) are already in place. Now, you can remove the "facebook" folder from Assets/Plugins/Android if you do not intend to use the Facebook login in your game. Likewise, if you do not want to use the Google+ login, you can remove the "google-play-services_lib" folder. Apart from that, all other plugins (ie. CloudBuilder.jar, customactivity.jar, gcm.jar and libCloudBuilder.so) are all mandatory, and removing any of them will lead to the sample not building or crashing at runtime! For Facebook support, do not forget to add in the file Info.plist two entries "FacebookAppID" and "FacebookDisplayName" with the relevant values as obtained on developers.facebook.com. Also, in the "Info" tab of the project, "URL Types" section, add an element and simply fill "URL Schemes" entry, with fbxxxxxxxxx, where xxxxxxxxx represents your Facebook ID application. Modify "Build Settings" tab, "Search Paths" section, "Header Search Paths" entry and simply add ./Headers in the existing list. You do not necessarily need to generate an Android project. Using 'Build and Run' in Unity should work right away, provided you're satisfied with the generic bundle 'com.cotc.unitysample' we chose. The sample comes with a ready to run project which can be tested right away. Now, if you need to use either Facebook, Google+ or push notifications, you need to modify the bundle because in this case, your game must use a dedicated bundle. As a first, you can see in these different sections how to set up for Facebook, for Google+ and push notification. Once you've completed the mandatory steps that Facebook and Google require from you in order to use their features, you need to slightly modify the Unity project in order to integrate the new bundle. Let's say you want the new bundle to be 'com.mycompany.mygame'. 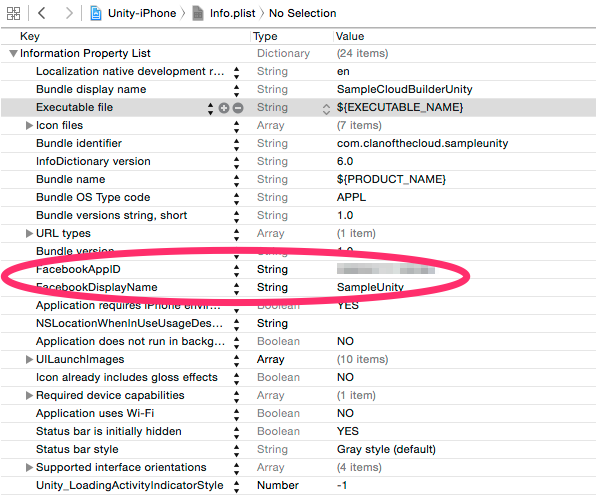 This new bundle must then be referenced everywhere we could find 'com.cotc.unitysample' previously. Let's have a look at all the different places where you need to change things. 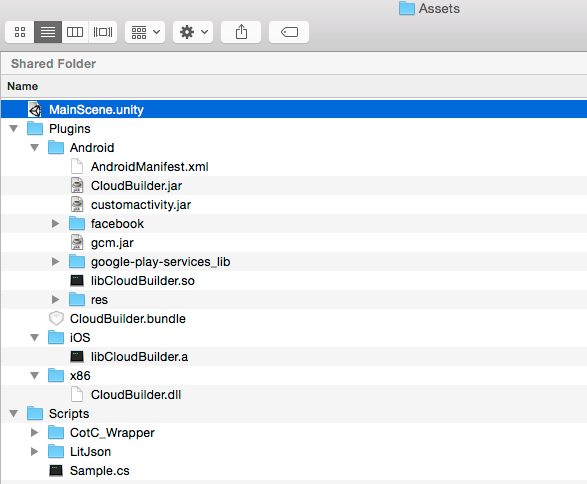 First report of the new bundle needs to go right into the AndroidManifest.xml in Assets/Plugins/Android. To reflect the change in the bundle name, we have to modify the folders under the 'src' folder. Note below how the initial 'src/com/cotc/unitysample' was changed to 'src/com/mycompany/mygame'. This is a requirement of Java where folders structure must match the bundle name. 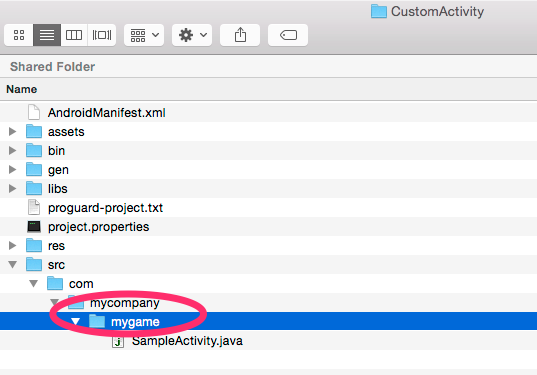 Now you just need to copy the 'customactivity.jar' generated file inside the 'Assets/Plugins/Android' folder so that Unity can use your new activity. To activate Facebook login and other features in your game, it is really easy now you have modified the bundle to an original one. Provided you have already made the mandatory Facebook setup, as reminded in the dedicated section, all you're left with is activating some sections in the following XML files. That's it, you can now use the Facebook Login in your game. To activate Google+ login and other features in your game, it is even simpler. Provided you have already made the mandatory Google+ setup, as reminded in the dedicated section, all you're left with is activating a single section in 'Assets/Plugins/Android/AndroidManifest.xml' file'. That's it, you can now use the Google+ Login in your game. Adding push notification support is really easy too. Make sure you have set up everything as required by Google first, as seen in the dedicated section. Section in the <application> tag. Section in the <manifest> tag. Last step is activating a section in 'Assets/Plugins/Android/res/values/strings.xml' and customizing it with your own values. 'cotc_push_notif_icon' should be the name of the icon you want to see displayed during a push notification. This icon must be present in your 'Assets/Plugins/Android/res/drawable' folder. 'cotc_push_notif_name' has to be modified using your new bundle, which would translate to 'com.mycompany.mygame.GCM_RECEIVED_ACTION' in our case. 'cotc_push_notif_title' is the string title you want to be displayed when a push notification is received. 'cotc_push_notif_sender' is the ID of your Google project as seen in th create a Google App section. And with that done, you're good to go with sending and receiving push notifications!